There are indeed times that life becomes so overwhelming that I don’t even have time to cook. Then there are those times that I am just having so much fun that I’m too lazy to take the time to write about it on my blog! Thankfully, since I last posted, the latter has been the case. I am feeling much better, work has been manageable and we have been busy having a little fun over the last couple of weeks including a camping trip for the Memorial Day weekend. This past weekend we celebrated my wife Kat’s birthday and as bad as I am at picking out gifts, hopefully I made up for it by cooking some of her favorite meals. On Saturday night I made Crab Cakes with a Dijon cream sauce then yesterday, her actual birthday, the leftovers made for a very special brunch; Crab Cakes Benedict! I was pleased with the way they came out but the Benedict would have been better with a traditional Hollandaise sauce. I used a “quick and easy” version and I don’t think it was as good as taking the trouble to do it right. I am going to include a link below that explains both the quick and the traditional Hollandaise. Speaking of sauces, the Dijon and white wine cream sauce is simply a variation from rouxbe.com, I just cut the recipe in half and used a little more wine to boost the flavor. You could certainly substitute plain non-fat yogurt but I don’t think a little bit of cream is all that bad for you as long as you practice moderation. If you do prefer to use yogurt remember not to let it come to a boil or it may curdle. Just move the pan on and off the heat to control your temp and you will be fine. Unless you are picking the crabs yourself, I recommend using only the “fresh” canned crab that you find in the refrigerator case at a fresh fish market or a warehouse store. In my experience the stuff on the shelf (next to the tuna) at the grocery store just isn’t worth messing with. Lump crab is quite sufficient for crab cakes, I don’t think the extra expense of “jumbo lump” or “back fin” is really necessary. Usually, I buy the 16 oz can of Phillips or Blue Star brand at Costco or Restaurant Depot. You may notice that the crab cake recipe itself is quite simple, even more so than my salmon patties, but there is a method to my madness. 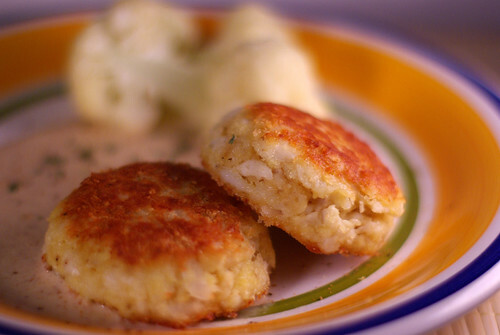 I have tried many different crab cake recipes including adding mayo, chopped onions, peppers and/or celery, Worcestershire sauce, and even cubed wonder bread to the mix. I have always gone back to minimizing the ingredients because crab has such a wonderful and delicate flavor…I prefer to keep it simple and let that flavor shine through. Combine the first four crab cake ingredients in a large mixing bowl and fold gently to combine. Mix well trying to break up the crab pieces as little as possible. Using a 1/3 cup measure mold the mixture into cakes pressing firmly to compress into an evenly shaped patty. Dust the outside of each cake with additional panko and set very carefully on a lined cookie sheet so as to avoid breaking the cake. (This recipe should make 6 equal cakes with a little left over for one smaller cake for the cook.) When all the cakes have been formed, refrigerate the crab cakes for at least 1 hour to allow them time to set up. Heat a large non-stick pan over medium high heat and add enough olive oil and canola oil (combined 50-50) to cover the entire bottom of the pan. When the oil is hot, using a spatula, very gently place half of your crab cakes into the pan and cook about 3 minutes or until golden brown. Gently turn and cook 3 minutes more. Remove the browned crab cakes to a cooling rack or paper towel then carefully wipe out the pan and repeat with the rest of the crab cakes. When all the crab cakes are browned, carefully pour off the oil and return the pan to the heat. Add the butter and when the butter has melted and just stopped foaming add the shallots. Cook the shallots for about one minute, stirring them to prevent burning then add the wine to the pan. Allow the wine to come to a boil and cook until the wine has nearly evaporated leaving only a few tablespoons of liquid. Add the cream, whisking to combine and continue whisking steadily until the sauce returns to boil. Cook, whisking continuously until the sauce has reached your desired thickness, whisking in the Dijon mustard at the last minute. Test the sauce for seasonings and add salt & pepper to taste. To serve, plate the crab cakes individually resting in a small pool of the cream sauce or serve with the sauce in a small dish on the side. If you have leftovers do try Crab Cakes Benedict for breakfast the next day! 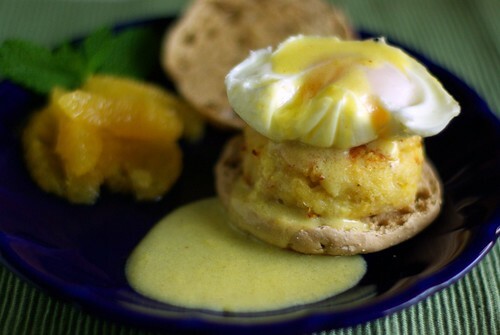 Simply reheat the crab cakes in a toaster or conventional oven until warmed through then serve them on a toasted English muffin topped with a poached egg and a little Hollandaise sauce. These are simple, elegant, and truly a great way to treat your loved ones to something special! Oh, but I do love pork! Granted, as we have grown both in age and in wisdom my wife and I eat much less pork than we used to. The old “everything in moderation” certainly holds true here and while I do eat more pork than beef, I also believe it’s all about balance and I try not to overdo it. No really…I do! Ok, I admit it; I did pick up this lovely package of chops just last week and last night was the second Tuesday in a row that we enjoyed them. It will however be quite some time before we have them again as they are a fattier cut of pork. Even though there is still some debate regarding the health benefits of pork I do try to pick the leaner cuts if I am going to cook it. So while you will see it here once in a blue moon I hope you can appreciate that we consider pork an exception to our otherwise healthy diet, a special treat if you will. The same holds true for beef. Some may call it rationalization but I firmly believe that eating whole grains, lower fat foods, and fresh vegetables as the major part of my diet gives me a little leeway. It allows me to enjoy myself from time to time and cook something a little less good for me without feeling guilty. And it tastes oh so good! 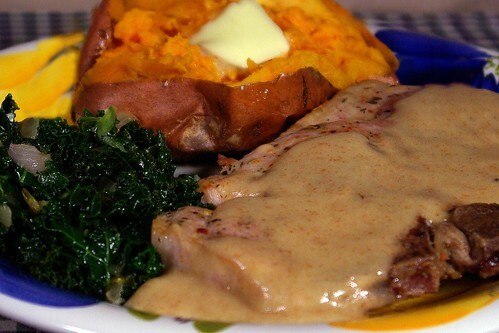 As a nod to that healthier diet this sauce is my lower fat answer to a Dijon cream sauce. There is no butter and there is no cream. I think the non-fat yogurt adds a nice creaminess to this sauce and in such a small amount that it doesn’t overwhelm the other flavors. Adding the yogurt at the last minute, off the heat, keeps it from separating or curdling in the sauce. You can use plain non-fat yogurt in many dishes in place of sour cream, milk, or cream just be sure not to let it boil. This recipe is written as a menu for 4 and it comes together in 1 to 1-1/2 hours depending on the size of the potatoes. Although I did not do it this night, I often sprinkle Italian Seasoned Bread Crumbs over the kale as a garnish. Try it, you’ll like it! Preheat the oven to 350 degrees. Rinse and dry 1 Sweet Potato per person. Using a paring knife carefully pierce each potato once, at least halfway through (from the side). Rub potatoes thoroughly with olive oil and bake 1 to 1-1/2 hours until cooked through. Heat the olive oil in a large sauté pan over medium heat. Add the onions and lower the heat to low. Add 4 good grinds from the Herb Grinder (about ¼ Tbsp) and cook slowly, stirring occasionally until the onions begin to turn golden. Stir in the garlic and continue cooking and stirring occasionally until onions begin to brown (about 30 minutes over all). Add the kale and toss to coat well with the olive oil, raise the heat and sauté for 1 minute. Add the chicken stock and cover. As soon as the stock comes to a boil lower the heat and stir once more. Cover and cook on low 10 minutes more, stirring now and then. Remove lid, stir and continue cooking uncovered to allow most of excess stock to cook away. Stir in the vinegar (if using) and serve. Sprinkle the pork liberally with the Italian Herb Seasoning Grinder then with kosher salt and set aside (at room temperature) for 20 minutes. In a large skillet heat 3 Tbsp. of olive oil over medium high heat until shimmering. 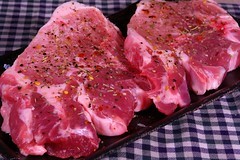 Gently lay the pork chops into the oil and reduce the heat to medium. Cook chops 3 minutes to brown then turn the chops and cook 3 minutes more. Move the chops to a foil or parchment lined sheet and place into the 350 degree oven to finish. Remove the pan from the heat and stir in 1 Tbsp. of flour. Continue stirring until the flour is blended with the remaining oil then return the pan to the heat. Cook, stirring for one minute more then add the chicken stock. Using a whisk, stir the stock until well blended then allow the sauce to come to a boil, stirring occasionally. When the sauce has thickened somewhat, whisk in the mustard and continue cooking and stirring until the sauce becomes quite thick. Remove the pan from the heat and turn off the burner. Remove the chops from the oven and place on plates or a platter. With the pan still off the heat, whisk in the yogurt until well incorporated then spoon the sauce over the chops. Serve with the cooked greens and sweet potatoes.